A new drama from director Jonathan Teplitzky and writer Alex von Tunzelmann, Churchill centers on the days leading up to D-Day. 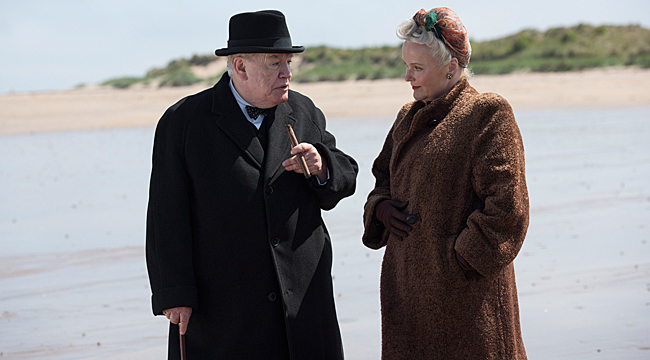 Having lived through and fought in one World War, British Prime Minister Winston Churchill (Brian Cox) has grown weary of fighting. Prior to the infamous Allied D-Day landings in Normandy, France in June, 1944, he’s become increasingly afraid that he’ll repeat his previous mistakes and the Normandy Invasion will turn into another Battle of Gallipoli and result in the loss of many lives. Churchill argues with his Allied political opponents, U.S. General Dwight D. Eisenhower (John Slattery) and British Field Marshal Bernard Law Montgomery (Julian Wadham) and even alienates his wife Clementine Churchill (Miranda Richardson). Director Jonathon Teplitzky and writer Alex von Tunzelmann recently spoke to us about the movie. The film’s June 2nd release is timed to the anniversary of D-Day. Teplitzky and Tunzelmann spoke about the movie in a recent interview. Talk about the initial inspiration for the film. Jonathan: Alex had already written the script. I talked to one of the producers about coming on. I liked the personal portrait that she painted. The work we did was focusing the film on that element. I thought it was a unique way of capturing and engaging an audience with his deeper and more layered personality. Alex: The answer is in some ways quite similar. I wanted to go behind the legend. Churchill has been covered a lot with things like The Crown, which is great by the way. But there’s a lot of room for Churchill because he had such a long and eventful life. I wanted to get to a side of him that fascinated me, which is his depression and his struggles with it. In 1940, he’s he great hero but by 1944, his contemporaries were writing in their journals that he was beginning to fail. As the Allies were beginning to win the war, it had taken a toll on him personally. Jonathan: Coming at such an iconic character at one of the most vulnerable moments is interesting. For me, the film is also a metaphor about aging. It happens to everyone. You get to a certain age and the power and control—regardless of what you did—fails. Younger people start to do the job that you used to do and your strength starts to wane. It’s about how you redefine your purpose at that point in your life. Did Brian Cox audition or did you just know he was the guy for the job? Jonathon: Brian was attached early on. Alex: So early on. I had written the script, and the producers asked me who I had in mind for Churchill. I really wanted Brian Cox. They said, “Maybe.” I was just throwing it out there to see what happened. It was like a dream come true. From the beginning, I thought he was perfect. He’s exactly the right age for the role. He conveys strength and vulnerability, which is what was needed. Jonathan: He can access those layers of emotion. Churchill was an emotional character. He’s not like the classic British character who is very reserved. He can bring layers to the character. Regardless of how cantankerous he can be, he manages to bring an emotional connection to the audience in a profound way. That’s one of Churchill’s great attributes. He had an ability to engage with the everyday person. Jonathan: He did a huge amount of research. It would be better coming from him. His interpretation of the character was the baby in Family Guy. That was his foundation for the role. In many ways, he was a big baby. The vulnerability of the child is a Churchill-ian characteristic. It’s what set him apart from other leaders. He had an ability to engage on the most basic level regardless of the fact that he was such a huge figure. I wanted to see more of Miranda Richardson. Talk about her performance. Jonathan: Both Miranda and Brian are two of the greatest British actors. We needed a Clemmie that would reflect the true Clemmie. She was very strong-minded and opinionated. Because we’re making a personal portrait of the man, it needed to be more layered. Their relationship was quite volatile and full of all the things that relationships are full of. Their chemistry on screen makes you feel that their relationship has been going on for a long time. For Miranda to come in be as powerful and memorable as she is against a fantastic performance from Brian, tells you everything about how wonderful she is as an actress. Alex: She’s amazingly perfect for the role. I definitely felt that she was an interesting character. In real life, she was not a pushover. Their marriage was complex and I think it’s something people can relate to. They had a long marriage. They lost a child at one point. There are rumors that Clemmie had an affair and they would break up. They’ve been through their ups and downs. People around him couldn’t challenge him but she could. This is a war movie without battle scenes. Talk about that. Jonathan: Either way, you could say it’s a battle film. Churchill is on the field throughout the film. I think our decision was the right one. This is about the toll war takes and the responsibility. It’s about the political process. The character is becoming increasingly isolated and he has to make these momentous world changing responsibilities. It’s about Churchill’s contemplation of those battles and war elements. He can’t get over the loss of life that has happened in the past and his responsibility for that and not wanting to repeat that mistake. His influence has been diluted. It’s about the psychological and emotional elements. If we put battle scenes in there, it would have taken away from the more personal moments of the film. I like that decision we made. It’s a Churchill battle without the wars. Every other depiction we’ve seen goes down that route and we often see newsreel footage. We wanted to mark out a territory different from that. Alex: In the first script, we had a war scene. It was so frustrating for Churchill because he had served in war. In the scene when the king stops him from going on the ship real, though he wrote a letter to talk him out of going and we dramatized it in the film. I think Churchill desperately wanted to be there. He was so driven to be there. Jonathan: Audiences bring a huge amount of baggage about war films. It allows the claustrophobia and intimacy of the drama to play out in the way that it probably did. During that operation, they worked out of bunkers and small rooms. How does the film relate to current times? Jonathan: One thing you could say about Churchill is that his experience allowed him to engage with what it really meant to send young people to war and what war was like. There is a huge issue now about leadership and his name always comes up. He gets thrown into that mix. His ability to understand what is and what is meant is reflected in the deep emotion that he held with real people and with the guilt and shame he carried. Unusually, he had a personal connection with that. Politicians now sit back while young people go off to fight wars. Alex: In the first World War, he left political life and he signed up and joined the army. When he fought on the Western front, it was an extraordinary thing. You can’t imagine a politician doing that now. It’s an amazing response, to put yourself in the firing line. He didn’t want to be the guy who stays at home.